Save Carbs for the Glass! – Eat, Drink, and Go! Save Carbs for the Glass! I generally make a protein and a veg combo for dinner. No starch, no carb. That’s what the glass is for! A good friend told me recently that to keep trim, you can either eat OR drink. Yup! Ok, but within reason. Carbs are delicious and I don’t shun them altogether, I just try to moderate. I frickin love bread and pasta and potatoes. Just not this week! 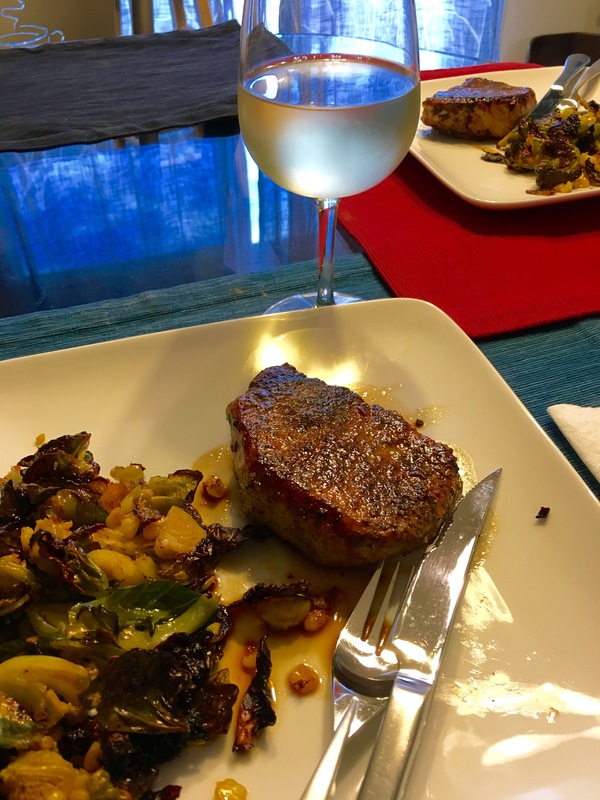 Tonight and last night, I happened to have wonderful proteins and veggie fixins for delicious, well-rounded meals. Last night – lamb. Tonight – pork. I happened to have tzatziki on hand from a party over the weekend and some random ground lamb that looked good at the store. Ta-da! 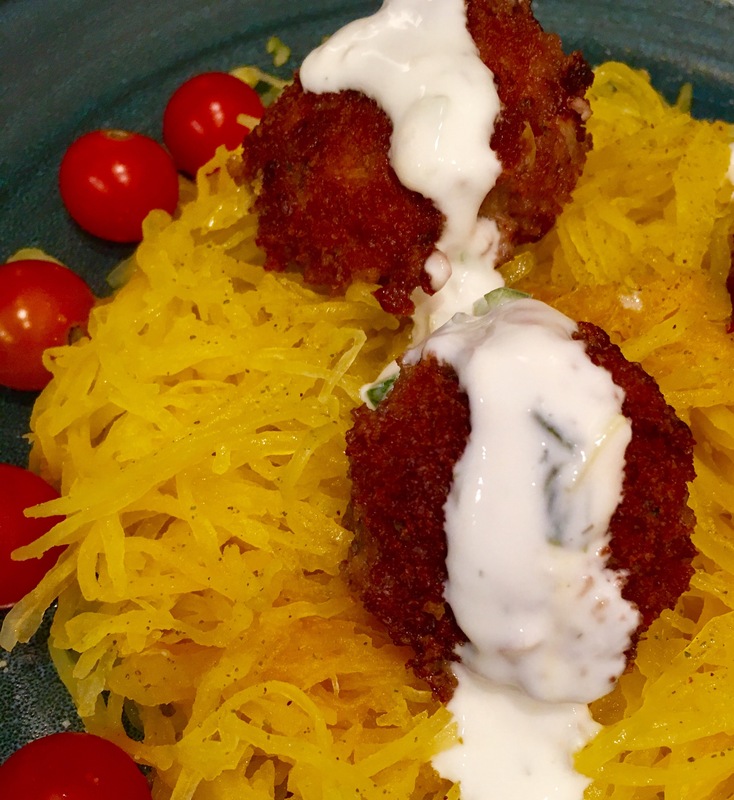 Lamb meatballs over spaghetti squash with a tzatziki sauce atop! I was doing about a hundred things while making dinner last night, so I only got the final shot! But tonight, I had a little more time. 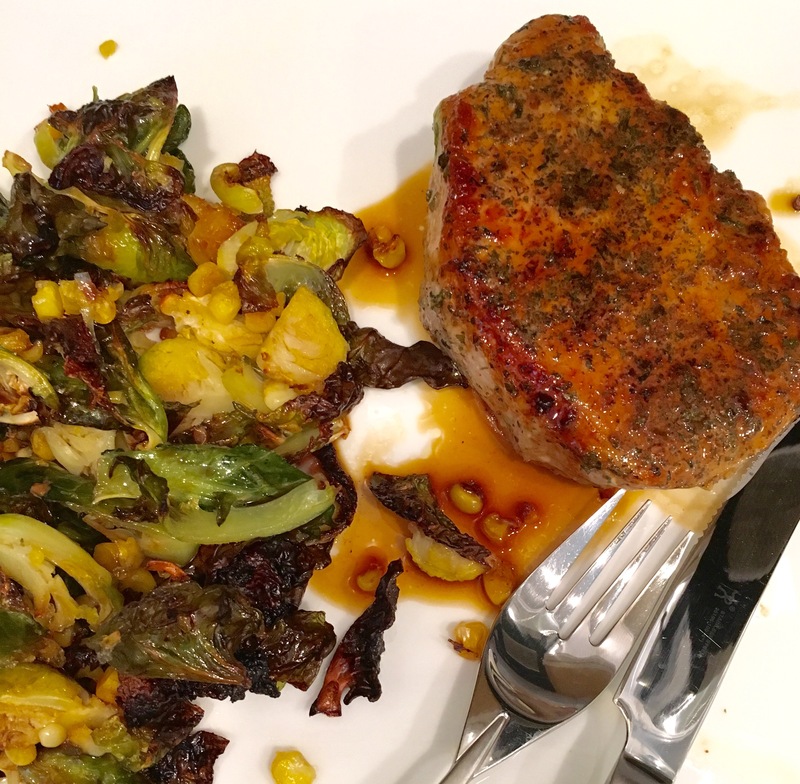 Tonight, pork and roasted corn and Brussel sprouts were on the menu. I’ve been having great successes with pork lately, sorry for the repetition. I roasted the veg with some chili oil, Mike’s Hot Honey, and basil infused olive oil. 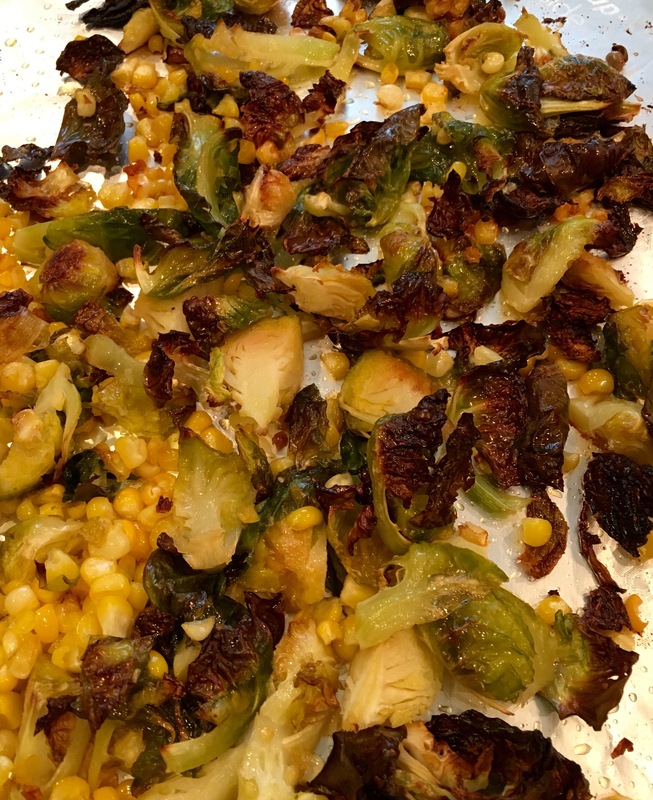 Just roast your Brussel sprouts forever and they will make you a believer. The heat of these additions totally mellow in the roasting; the sweetness of the veggies plays perfectly off the spice leaving just a hint of heat. 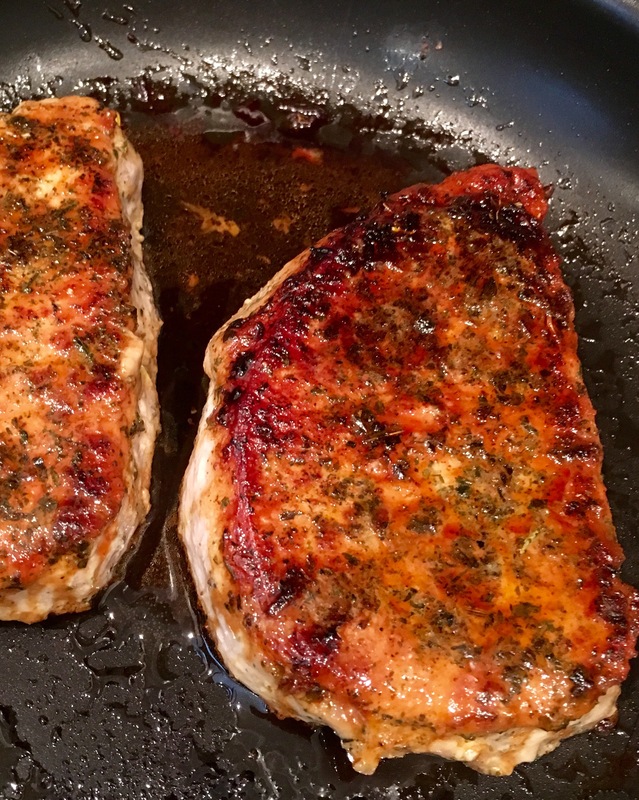 I seared the pork in butter, but first really got it going with a sticky mix of dry spices (sage, thyme, and basil), Mike’s Hot Honey, and brown sugar. I just knew this was gonna be good. I knew, like you know with a good melon. And it did not disappoint. One way to eat well and smart is portion control, in the pic below, you can see a good example. This doesn’t always happen, but I try!! 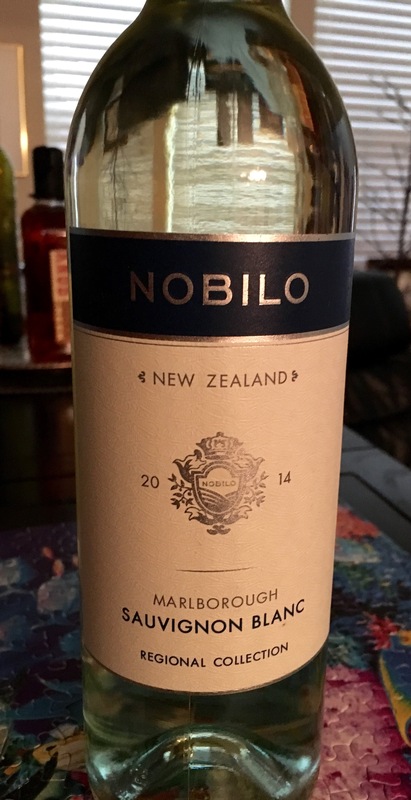 I paired this delicious dish with my favorite white, Nobilo Sauvignon Blanc. Try it, you’ll love it.